Last week Company magazine announced that October will be the last of their magazines available in print. Of course, they’ll still be online and take advantage of popular social media channels, but for me it hits home that actual, hard copy, print magazines are on the way out. I mean, they won’t just disappear from our shelves all at once. But the cost of producing magazines paired with the decrease in sales of these publications means its inevitable for any business wanting to maximise profits, to follow the most cost effective ‘trend’ and move their magazine online. We’ve seen the same happen in the Book industry, whilst some of us still love the new book smell and the feel of having an actual book in our hands, others have their kindles. Personally, I love having a book, but I’ve used my iPad to purchase books too. This industry has been taken over by Amazon’s Kindle, Apples iPad and various other e-readers available on the market. Even Tesco released the Hudl to compete in the market. The unique selling points of these? You can download what you want instantly, instead of going to your local book shop, or waiting for it in the post. You don’t need a shelf in your living room full of books you probably won’t read again, you simply store them on your device. You don’t have to feel pressured into borrowing a book to someone, knowing you won’t get it back. The trend towards online publications has seen the majority of companies offer their customers an online version alongside the hard copy. I buy Look magazine once in a while, and know that if I can’t find it in my local newsagents, I can go home and get it on my iPad. I know it’s more environmentally friendly for us all to switch to online magazines, but I can’t help but feel weird about it. There is just something about being able to flick through a magazine and then give it to my sister when I’m done. I have a monthly subscription to Vogue and I love getting it through the post and having it on my shelf. I think we’ll see more magazines following Company and ceasing their print version, but I’m sure there will still be print magazines for a long time yet. Look at the book industry? You can still get the majority of books in hard copy if you want. 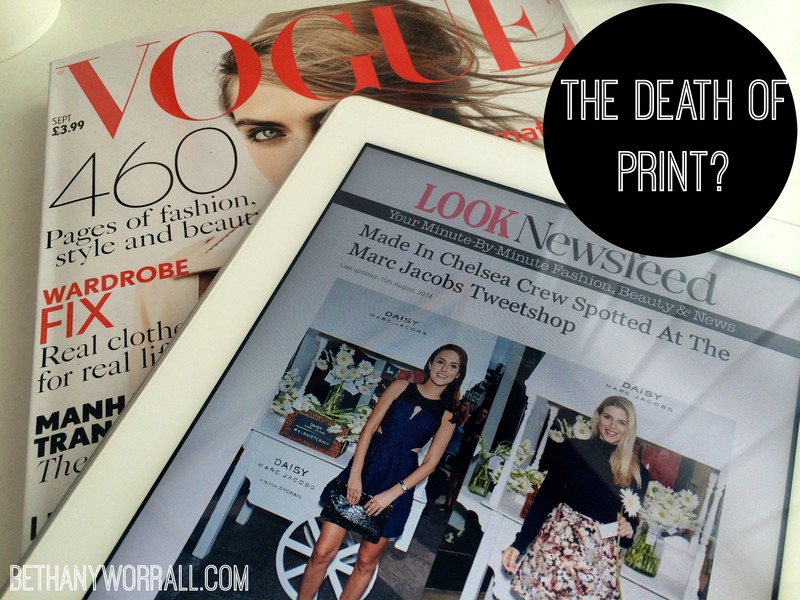 I’d love your opinions on this – do you prefer magazines in print? Previous Bloggers – Too Big for their Boots? Next YouTubers – A License to Print Money? I was sad to hear about Company magazine – an Irish teenage magazine announced they were finishing too the same day so it definitely looks like a lot of them are heading the same way. I have to say I personally prefer magazines (and books) in print. I spend enough time staring at screens so it’s nice to take a break from that. I know what you mean about womens magazines, I rarely read them myself. I like Vogue to flick through the ads mainly, I’m a Marketing graduate, what can I say?! haha 🙂 I do find that the majority of magazines are crappy and totally agree with you! I read Look which I find is more fashion based, but I do skip most of the celebrity rubbish!!! Yeah, I’d be happy for books to stay! – nothing better than sitting down with a book and a hot chocolate!! I know what you mean, there’s no feeling like flicking through a thick, glossy magazine but it seems there will come a day when they die out and everyone switches to online! I think the traditional format will be missed though and I think a lot of people actually favour the physical versions! I have a Kindle but I always still opt for the physical version of a book if I can! It’s just cost, it’s much cheaper to get it online!